A classic etching of a rose in bloom has a real vintage feel and by using colour combinations and contemporary font styles, you can give this lovely design your own modern twist. We can match your wedding colours, so just specify the colours you want when ordering and we'll adjust the design to suit. 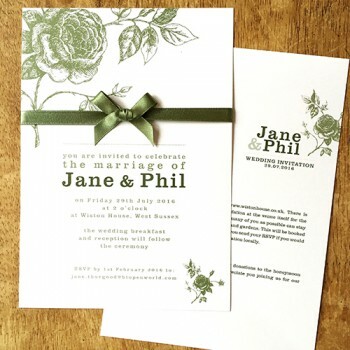 This design comes in all forms of matching wedding stationery, so you can continue the feel of this lovely design throughout your wedding day. However, if you need your order quicker than that, please let us know at the time of ordering and we will endeavour to meet your deadline. Orders will be sent via Royal Mail First Class Recorded delivery.